Part of a key exciting announcement at Ignite was Microsoft Search in Bing. Microsoft Search enables employees to be more productive by allowing them to search all sites and assets across their tenant. 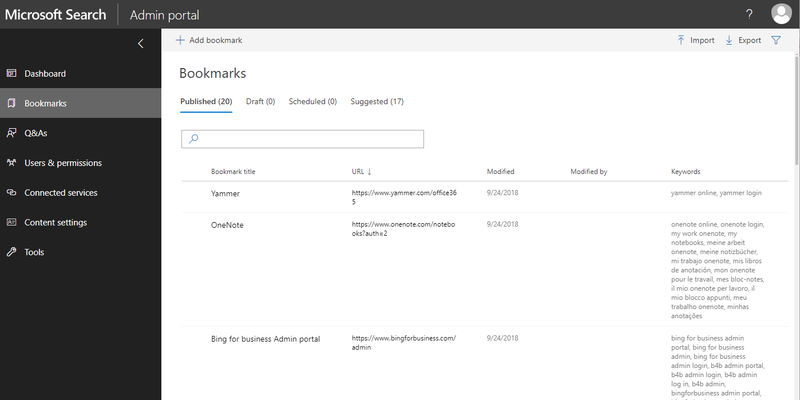 Microsoft Search in Bing aims to provide unified work and web search experiences, including the ability to search and find PowerApps in your organization. The integration of PowerApps in Microsoft Search enables any user, within your organization, who has had the app shared with them to discover and use it right inline to complete tasks within the search results. This is a great way to drive user adoption and allow teammates to find the apps they need. Within the Microsoft tenant, certain PowerApps can be simply found with a search – including ones to report time off and send appreciation to coworkers. Read the Microsoft IT PowerApps in Microsoft Search case study which has insights on what scenarios Microsoft has enabled with the powerful combination of Microsoft Search and PowerApps. 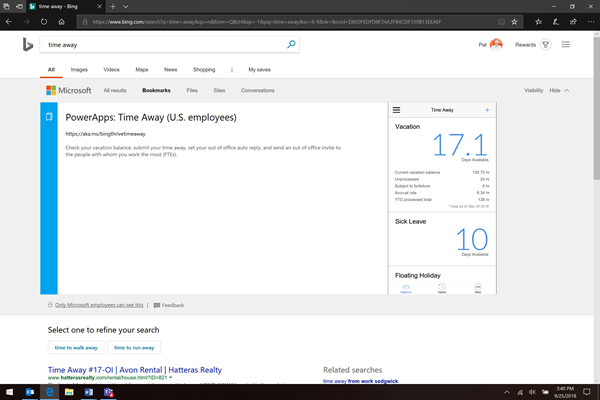 This image shows a user signed into bing.com that has searched for "time away". The Thrive Time Away PowerApp is returned in the search results. No more bookmarks or digging in emails, now simple searches can help users find PowerApps. To create a search result that brings PowerApps inline, you add it as a bookmark in the Microsoft Search admin portal. There are step by step instructions on making your PowerApp discoverable in Microsoft Search. Start by navigating to the Bookmark page of the Microsoft Search admin portal. Including enterprise PowerApps into Bing search is another great way to improve app discoverablity in your organization.